See the range of products we stock, and get advice on selecting clothing or equipment suitable for your intended use. Our products are carefully chosen to suit the sometimes harsh environment we have in Argyll and we are confident of their performance. The West coast is a great place to enjoy a variety of outdoor activities and possibilities within an hours drive of Oban are almost endless and include skiing, winter climbing, hillwalking, camping, mountain biking, watersports and climbing. Welcome to Outside Edge based in Oban on the West Coast of Scotland. 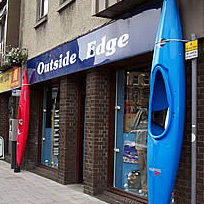 Outside Edge is a specialist outdoor sports shop run by enthusiasts for enthusiasts and the West of Scotland is an ideal place to live or holiday if you enjoy the great outdoors. There are plenty of opportunities here for skiing, climbing, kayaking, diving or walking or cycling and the aim of our website is to help you maximise your time in the Argyll area and to help you with some of the equipment and clothing that is suitable for this part of the world. Products gives you a breakdown of the range of products we stock, not all of them because we keep too much to list it all but gives you advice on selecting clothing or equipment suitable for your intended end use. Special Offers is kept up to date with all our sale items and special offers throughout the year. Outdoor Information gives you a bit of local knowledge before you get here and has articles on specific routes and walks as well as more general info. Links gives you access to other websites some for local services and some from product suppliers where you can access more detailed product information than we give you. Photo Gallery – As images speak better than word s our Image Gallery show you the vast range of outpuruits which we have available locally. The shop was set up in 1989 by Dave and June Bleazard who recognised the need for Oban to have a specialist outdoor shop to supply the local needs after having to travel out of the town to buy their outdoor essentials. Dave and June have always been keen on the outdoors and together ski , kayak, cycle and walk having met whilst they were both working at Arran Outdoor Centre. Dave has also extensively dived in the area and is a kayak coach. Our son Michael features in a lot of the pictures and works at the Glasgow Climbing Centre as a climbing instructor and route setter. We have been helped in our venture by several members of staff over the years and our current full timer is Iain Marshall who is a keen river paddler as well as being a very good photographer and a competition grade piper. Our aim is to be able to provide quality advice and recommendations whether on local information or product information so if there is anything you want to discuss then don’t hesitate to contact us .